This was just the holiday we were looking for. Booked with Book Pack Fly and got a great deal. The hotel was exactly what we were looking for in our budget. It was clean, tidy and in a great location. The food wasn't haute cuisine but ok and considering what the Cypriots were going through everyone was really friendly and helpful. From my initial research and booking with Book Pack Fly everything went smoothly and not one thing went wrong during the whole holiday so can't complain about anything from travel agents, airline, hotel and resort. the hotel is about a ten to fifteen minute walk to the beach on a main road with the market at the top end so you have cars vans and buses coming and going all day long. the hotel its self to me dose not have a lot going for it. the management of it stay in there office all the time and send messages to the staff by telephone. you can not get to speak to them yourself. staff can be serveing you and the phone will go and they just leave you to take thing to them. the staff do there best to be helpfull apart from one who works behind the bar who can be arrogane at times. we were all inclusive and the meals are always the same each and every morning.lunch times its only chips with this and that.evenings you are o k if you are a rabbit has you will find five different salads each night along with a meat and a fish course of which i will say is always hot. the rooms all have air conditioning but in the room which we were given it was leaking and to me had been for some time by the smell of it so we asked to be moved. in your room you can not have a kettle or a iron if found they are removed and not handed back till you leave. not the best not at all we not be going back to it. Arriving at 2.30am in the morning the first impression was what have we let ourselves in for! The hotel was on a main street in the town centre and upon entering the lobby we were greeted by a man who, to put it mildly, was put out that we had the temerity to arrive at that time. He was surly and grumpy, barely went through the motions of assisting us then gave us the room key with no mention as to how to get to the room. Eventually we found the room which was dingy and smelt of tobacco. My wife needed to use the toilet and opened a door that she thought was to the toilet and found herself in a room which was occupied by other residents! In the morning we were woken up by the sound of traffic outside and when I looked out of the window instead of 'the magnificent views of the Mediterranean and/or the mountains' as shown on the Thomas Cook website I was greeted with a view of dilapidated apartments, washing lines and lots of traffic just a few metres away. We visited in March for 6 days on a property hunt, as a result we booked this hotel mainly as it was in the centre of Paphos town. This was our mistake and we now realise that the place to stay is in Kato Paphos nearer to the beach and the restaurants e.t.c not in Pathos town. The food was hit and miss breakfast O.K and buffet and carvery nights good but two other nights very poor indeed. We are a family and in March the hotel was full of pensioners but what great pensioners they were. As for the staff , they are the thing that keeps this hotel afloat, good friendly staff who seemed to be in to the 'Cyprus spirit' despitre half of them being English, Polish e.t.c. I wouldnt choose it again but mainly due to location, we enjoyed our stay. We found the staff to be very friendly & helpful.The hotel itself was always kept very clean. Our room which was on the third floor faced inwards towards the town and although there was double glazed patio doors we were still able to here the traffic below which was not a big problem as its quiet in nov but in summer must be very noisy. We booked half board and breakfast was fine with the usual fruit juice,cornflakes,toast e.t.c e.t.c. We found the evening meals to be lacking in options as almost every night was either pork with curried potatoes,beef with curried potatoes or omelette and as for the buffet night oh boy not good at all,so only actually ate there one night.As most of the guests were of the older generation the enterainment was quite suitable with 60s 70s & 80s music. 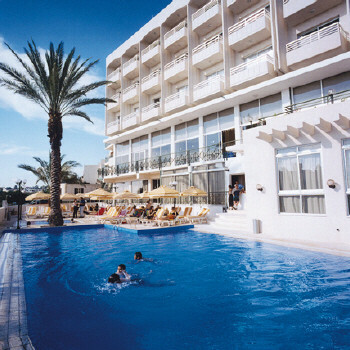 We usually visit Cyprus in July so bearing that in mind I don't think we will be booking this hotel in future. There is a small carpark at the rear of the hotel and parking on the opposite side of the road if thats full.The market and town shops are a short walk away.The harbour area is 5-10 mins drive and Coral Bay about 20 mins drive. Located on a main road in Pafos town the hotel is a 20 Min walk to Kato Pafos & the Tomb of the Kings and a 7 min walk to Pafos Market. From the road the hotel is a little lost as it is fronted by shops,once past these you enter a bright well furnished large reception one end and balcony/bar at the other. Overlooking the pool and in the distance Kato Pafos,the rooms although not large are comfortable and well furnished including t/v with 14 channels some in English,free airconditioning and a good size bathroom,those facing the road have excellent double glazing and with this shut very little can be heard from the daily bustle,sea/pool view rooms have standard double glazing which can lead to some noise. Below the reception is the dining room with access to the pool and pool bar. The staff are clean smart and a fair mix of nationalities all speaking good English. The housekeeping staff do a professional job the rooms and all public areas are smart and clean. Paphos was very beautiful, we enjoyed 2 weeks of sun and relaxation.The hotel was very nice and clean. The staff was very helpful and the food was excellent. We had a very nice time and we are definately returning back!! !